Edited by Gregory Cheng . Venous thromboembolism (VTE) is a common disease with an incidence of over 1 in 1000 in Western countries. It is associated with significant morbidities and costs. Postthrombotic syndrome may develop in one third of patients with deep vein thrombosis (DVT) with considerable socio-economic consequences. 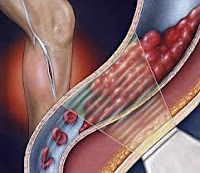 DVT is usually seen in patients with underlying risk factors and patients undergoing major pelvic and orthopaedic surgeries. Numerous guidelines suggest use of DVT thromboprophylaxis in these patients, but despite encouraging results of thromboprophylaxis, many studies showed low compliance rates with such guidelines. Also in regions with low DVT prevalence, the benefit of pharmacological prophylaxis is not clear. Patients undergoing laporoscopic operations are also at risks of VTE because of increased venous stasis caused by abdominal insufflation and prolonged reverse Trendelenburg position. Most DVT occur in the lower limbs, but DVT the arms may account for 5% of VTE cases. Cancer and its treatment are recognized risk factors for VTE and extended prophylaxis in ambulatory cancer patients may be required. Recent radiological advances have facilitated the diagnosis and management of DVT and have also identified vena cava malformations as a new etiologic factor in young DVT patients. Endovascular therapy is a potential treatment option in acute DVT. Chronic liver disease is recently recognised as a hypercoagulable state. All this issues will be addressed by various experts in this book.